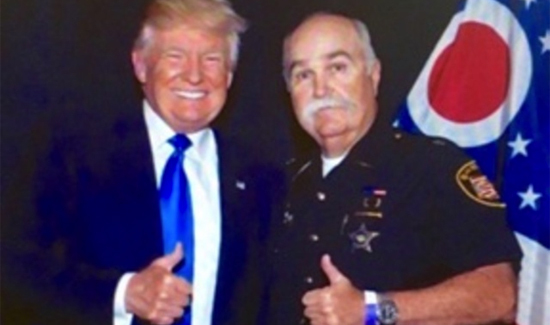 This is part of one of the tweets Butler County, Ohio, Sheriff Richard Jones (pictured above with PEOTUS Donald Trump) posted Thursday night, referring to his plans to crack down on local companies and businesses that hire undocumented immigrants. This has become the norm. First of the year will all change. To the companies that hire illegals and violate the law we r coming. Anyone who knows or works at places that hire illegals. Please send these places 2 me. Trump’s stance on immigration has been clear since his bid for the presidency, and he reiterated plans to build a wall along the U.S.-Mexican border during his Dec. 1 stop in Cincinnati as part of his “Thank You” tour. “We will construct a great wall,” Trump said at the Dec. 1 rally. And Jones seems to echo the same sentiments. “The next President of the United States—illegal immigration is going to be one of the top two things that he’s going to deal with, and we’re all going to deal with it,” Jones said.